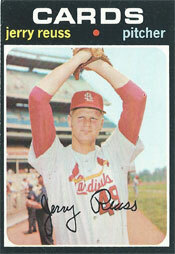 Jerry Reuss, left-handed pitcher and St. Louis native, joined his hometown Cardinals at age 20 in 1969. He was a neophyte on a team of championship-tested veterans such as Bob Gibson, Steve Carlton, Tim McCarver, Lou Brock and Curt Flood. On Nov. 11, 2014, I visited the Dodgers Adult Baseball Camp at Historic Dodgertown in Vero Beach, Fla., to seek out Reuss for an interview about his time with the Cardinals. I found him as he climbed the stands at Holman Stadium after coaching a morning game between campers. Dressed in a home white Dodgers uniform with the familiar No. 49, Reuss, 65, quickly and graciously accepted my request for an interview, inviting me to find a seat with him in the shade in the stands. We sat near the top row along the first-base line. Reuss answered every question and was patient, thoughtful, articulate and polite. A graduate of Ritenour High School in St. Louis, Reuss was selected by the Cardinals in the second round of the 1967 amateur draft. (Their first-round pick was catcher Ted Simmons.) Reuss debuted with the Cardinals in September 1969 and pitched for them in 1970 and 1971. He had a 22-22 record with the Cardinals before he was traded to the Astros in April 1972. In a 22-year major-league career, primarily with the Dodgers (nine years) and Pirates (six years), Reuss was 220-191 with a 3.64 ERA. In 2014, he published a book “Bring in the Right-hander,” an anecdote-rich retrospective on his career. You can order an autographed copy at his Web site www.jerryreuss.com. Q.: Early in the 1969 season, you were a 19-year-old left-hander assigned by the Cardinals to Class AAA Tulsa. The manager there was Warren Spahn, perhaps the best left-handed pitcher all-time. What was it like for you to play for him? Q.: In your major-league debut for the Cardinals on Sept. 27, 1969, at Montreal, you started, pitched seven scoreless innings, gave up just two hits, drove in a run with a single and got the win in a 2-1 Cardinals victory. The bullpen gave up a run in the eighth. Do you recall that your first big-league hit was the game winner in your first big-league win? Q.: Your batterymate in your big-league debut was Tim McCarver, who had been the Cardinals’ catcher in three World Series. What was it like pitching to McCarver? Q.: Ted Simmons was your catcher at Tulsa and then with the Cardinals. He’s known for his hitting. Does he get the credit he deserves as a catcher? Q.: What was Bob Gibson like as a teammate? Reuss: “He was tough. He demanded excellence of himself and everybody who played behind him. His feeling was, ‘If I’m going to come out here and work this hard and give what I give _ and he was hurting at this time physically; his elbow was killing him _ then I expect everybody to play like that. I expect that same intensity from anybody else.’ And he wasn’t afraid to let people know about it. Q,: What did you think of your fellow left-hander on the Cardinals, Steve Carlton? Reuss: “With St. Louis, he showed just how good he could be. I don’t know that if he had stayed with St. Louis that he’d have had those same kinds of seasons he later had with the Phillies. When he went to Philadelphia, he changed his mental outlook. “He didn’t like to run. So there was a Phillies strength and conditioning coach, Gus Hoefling, who said, ‘You don’t have to do that. Here’s what we’ll do. I’ll give you all the conditioning that you need.’ Steve bought into it. He believed it. If you believe something, then there’s a good chance it is going to work for you. Next: In Part 2 of the interview, Jerry Reuss offers his views on Joe Torre and Gussie Busch.